Kim Kelleher’s latest move has landed her at Wired magazine, where she is VP-publisher. Photo courtesy of Kim Kelleher. As a UW student in 1989, Kim Anderson Kelleher ’93 couldn’t have known just how much the world — and specifically, the World Wide Web, created that same year — was about to change. Or that she — a history major when research meant shuffling through sweetly musty stacks at the Wisconsin Historical Society Library before pecking out papers in the Memorial Library computer lab — would one day helm Wired, the revered digital and print media powerhouse that reaches 47 million people annually. Kelleher was named VP-publisher of Wired magazine in September 2014, when parent company Condé Nast’s president Bob Sauerberg called her a “proven business leader” and a “true pioneer in this industry.” He’s referring to Kelleher’s striking trajectory since the Sister Bay, Wisconsin, native’s UW days, when she leaped straight into the New York City workforce after earning her bachelor’s degree. Her more than two-decade career in “storytelling” has included stints as VP-publisher of Self magazine, the first female publisher of Sports Illustrated, and global publisher of TIME magazine. She’s served as president of Say Media (the umbrella site for xoJane, ReadWrite, and a dozen or so other sites) and was named Ad Age Publisher of the Year in 2011. But it’s the move to Wired that has Kelleher feeling especially excited, particularly on a personal level. That childhood spent in a tiny Door County town — in a house without cable TV and the closest movie theater forty-five minutes away (not to mention dial-up Internet and the limited reach of AOL keywords in her college years) — couldn’t possibly have prepared Kelleher for a high-speed, high-profile digital media career. But it imbued her with the Midwestern family values that she draws on today, not only as a wife and mother of two children under the age of ten, but as a woman in leadership. What do you get when you combine a ragtag gang of irreverent students, a little cash, and a stack of sea green paper? 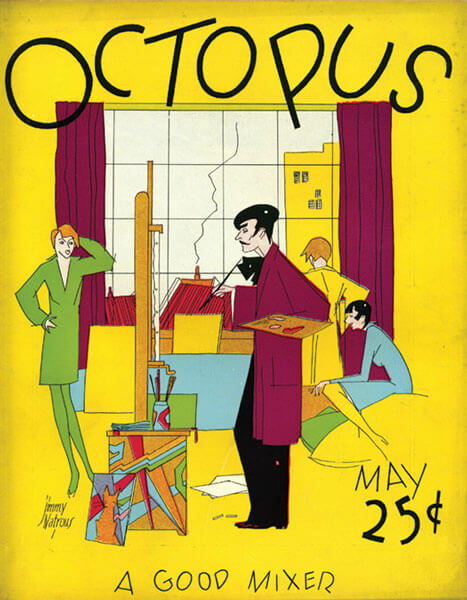 The answer is the Octopus, the longest-running UW humor magazine, published from 1919 to 1959. “The Octy” offered a space for student writers and artists to experiment with satire, and the result was a politically incorrect jumble of jabs at faculty, administrators, and fellow students. Initially, the Octopus was published erratically — only when the editor had enough content to fill an issue and enough advertising dollars to cover the cost of printing. The magazine grew in sophistication over time from its humble debut with, yes, green paper and an “office” in an apartment on North Butler Street. The publication’s heyday came in the late ’20s and ’30s, thanks in part to three staff cartoonists who would go on to become directors of major university art departments. The one who stayed closest to home was the late art and art history professor James Watrous ’31, MA’33, PhD’39, whose mark can literally still be seen on campus: he created the large mosaic pieces that adorn several UW buildings and the Paul Bunyan murals in the Memorial Union. Watrous was also one of the major forces behind planning and fundraising for the original Elvehjem Museum of Art, which has expanded into the current Chazen Museum of Art. In the Octopus, Watrous stretched one of his first tentacles into the campus art community. He drew twelve covers, including the one featured here. Sometimes, funny things make a big difference.